Seton Gordon really created himself as naturalist, photographer and writer, the first such in the country, his first book appearing when he was eighteen. In all he wrote 27 books, two specifically about the Cairngorms where he grew up and first explored and returned to many times throughout his long life. He wrote with a revelational wonder and freshness, writing in poetic prose descriptions only possible by someone intimately at home in the hills with their interacting, connected features: birds, plants, trees, geology, weather, Gaelic culture, place names, history, folklore - an ecologist before the word was coined. 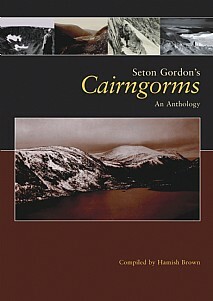 Hamish Brown selected passages for Seton Gordon's Scotland and has now made a fascinating choice from Seton Gordon's extensive writings about the Cairngorms. There are descriptions of hill days throughout the seasons and intimate descriptions of wildlife. Seton Gordon lived to a great age but the Cairngorms were his first, young man's enthusiasm. Hamish Brown, no mean mountaineer and lover of the outdoors, has garnered biographical material and archive pictures for a book which everyone with an interest in the Scottish hills will welcome. Sure to be of enormous appeal to all who appreciate and enjoy reading about Scotland's wild places and its flora and fauna; hill-walkers, climbers and everyone with an interest in the natural world and in particular Seton Gordon's writings.